Nit bolje kompozicije, nit uzasnije shminke i odece! Ha ha ,bas je kul slika. Vrlo rado bih ga posedovala!!!! I ja bih ga rado posedovao. hah,kako je luda slika . Zaista mislis da mu lepse stoji kraca kosa ? @Shelobina:svirka je odlozena zbog vremena.najavljena je kisa za nedelju.ako Bog da,bice svirke do kraja avgusta.ako ne,jebiga. Meni je on najlepshi bio sa frizurom kao sa FWTe! Sta je ovo,neka fotomontaza ili sta ? ju!bas lici na Johnny Deppa!na momenat sam pomislila da je to stvarno on! Ma plagijator! samo ga sjbala Vanesa Paradi! For many artists long tours have the risk that a lot of things become routine. The energy level is not always very high and the circumstances change a lot. Tuomas is very clear about that: â€œIt never gets that far that youâ€™re not exited at all or that it feels boring. Every single time it feels good to see the people and play. Some days are better and others are worse. Of course you have really bad days in the tour; when youâ€™re really tired, pissed off or sick. Then you have to think that it is not always fun. Because it still is a job, work isnâ€™t always fun. One of the hardest things in this occupation, because you canâ€™t get away from your work. I really like this pressure." Unexpected he starts to talk about the difficulties he has with being an artist, who gets more and more fans. Many people think that the person on stage is totally different from the person in normal life, but it isnâ€™t. With the last record the audience seems to be grown more and more. Almost all the shows on this tour are sold out and they have a huge success at the moment. Still Tuomas is very down to earth. When Marco (bass player and vocals) joined, the band seemed to be more connected and everything seems to fit: â€œIt was just instant chemistry. Everything worked that way. Tarja (front woman and vocals- SD) was also behind the decision and it was never a problem. I donâ€™t want to emphasize Marcoâ€™s impact too much, because it was not only him who saved the band from falling apart. He was a very big part and he really brought a lot of serenity to the band. Heâ€™s a very calm guy and almost never gets angry. Whenever we have fights, everybody starts yelling and he is the one who says: come on letâ€™s talk about it. Tuomas is very critical and doesnâ€™t take the easy way out: â€œWhen I doing a song I am mostly concerned: am I gonna like the song in the end? But then, what comes next is: that the other guys and Tarja must like it. Thatâ€™s the biggest concern and all the media and the fans come after that. The thing is when I am doing the song, honestly, I think about if itâ€™s too easy for Marco, to hard for Tarja or does Empu need a longer guitar solo? I shouldnâ€™t be thinking that, but I want to make stuff they enjoy to play too. I feel myself responsible for that. The most simple thing, I told this many times to the band and the crew, is: no matter what, I want that everybody has a good time. Tuomas sounds sad when he continues. Sometimes he looks up to the back of the cantina to think about a question, but most of the time he sits there; relaxing, staring at the table. â€œI think itâ€™s going very well with everybody. The energy is back again. 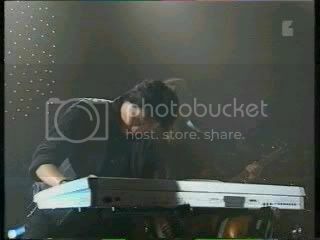 It was gone when we where playing in Helsinki and Germany at the end of the year (2004). We were so tired, but now it goes better. At the moment I am totally focussed on this tour, but I have some ideas for new songs. The band is still very realistic and Tuomas is very down to earth when he talks about the success: â€œI think I understand it better when all this is finished, but now itâ€™s just being in a rollercoaster and enjoying the ride. Itâ€™s totally amazing whatâ€™s happening now, especially because we never planned it: it just happened. Just try to have the same ideology that you had 8 years ago when we started the band. I think we managed to hang on to it very well. As persons weâ€™ve not really changed that much. We still do the same stuff we did 8 years ago, thatâ€™s the basic idea and that hasnâ€™t changed." 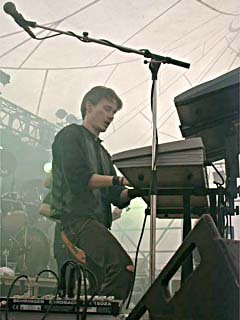 Tuomas Holopainen is the one who brought Nightwish this far and he always had a big devotion to it. He sounds surprised when I ask him about this, but after some seconds he smiles: â€œDevotion is a good word. I have doubts sometimes. A prominent thing is that I never can draw a line between my personal life and my work. Itâ€™s all one big thing, the whole Nightwish and my life: itâ€™s everything I am, I do, everything I think. I donâ€™t care, I donâ€™t complain, itâ€™s a way of life. When it goes wrong, at least you can say that you tried your best. Thatâ€™s the most important thing. Itâ€™s a good rule in life: nobody should expect more than try to do your best. It works for everything. Itâ€™s a hard world and you donâ€™t always know that you have done your best. Maybe I should have done moreâ€¦ Wow itâ€™s something unique that I talked so much. Most of the time it doesnâ€™t come out and I donâ€™t know what happened now. " Then Tuomas has to go, because he needs a cup of tea and prepare himself to go to on stage for the gig at Wieze (Belgium). Mogao si da stavis jednostavno link pa ako nekog interesuje,neka procita. Bas je slika do jaja...Lepo sam se nasmejao.